WOLVERHAMPTON skipper Freddie Lindgren praised the Monmore Green track staff following their 46-43 home win over Belle Vue. The victory sent the Parrys International Wolves back to the top of the Elite League as they maintained their 100 per cent home record. While it was another battling display from Peter Adams' men, Lindgren described the track staff as the side's unsung heroes. "The local area has had so much rain in the last couple of days and the downpour at lunchtime could have put the meeting in doubt," Lindgren said. "We're very lucky at Wolverhampton to have one of the best track teams in the country and they deserve a lot of good words for all of their hard work just to get the meeting on. "They didn't just get the meeting on, the created a surface that gave us some great racing and it was a really good meeting as we expected. "We knew it was always going to be tough, but another win is all that matters and we're happy to be back at the top of the league." Sam Masters dropped just two points on another impressive night for the Australian ace while Freddie Lindgren came up with some vital points at No.1 again including a stunning ride in heat 11 which saw him pip Craig Cook on the run to the line. Joonas Kylmakorpi enjoyed another solid night in the heat-leader position while Swedish duo Jacob Thorssell and Peter Karlsson endured mixed outings on a much tougher night than last time at Monmore against Coventry. Max Clegg put in a much more encouraging showing including one of the rides of the season to squeeze past Belle Vue duo Richie Worrall and Max Fricke down the back straight in heat five. Kyle Howarth's score was hampered after an exclusion in heat four after running into the back of Scott Nicholls. 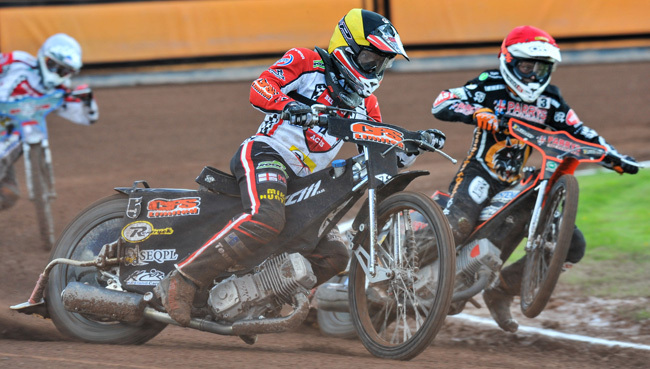 The Parrys International Wolves are next in action on Saturday, July 2 at local rivals Leicester before they host the Lions at Monmore on Monday, July 4. WOLVERHAMPTON 46: Sam Masters 13, Freddie Lindgren 9+1, Joonas Kylmakorpi 7+1, Jacob Thorssell 5+1, Max Clegg 5, Peter Karlsson 4, Kyle Howarth 3+1. BELLE VUE 43: Scott Nicholls 10, Richie Worrall 9+1, Matej Zagar 8, Craig Cook 7, Max Fricke 5+1, Steve Worrall 2+2, Joe Jacobs 2+1.